Remarks by H.E. 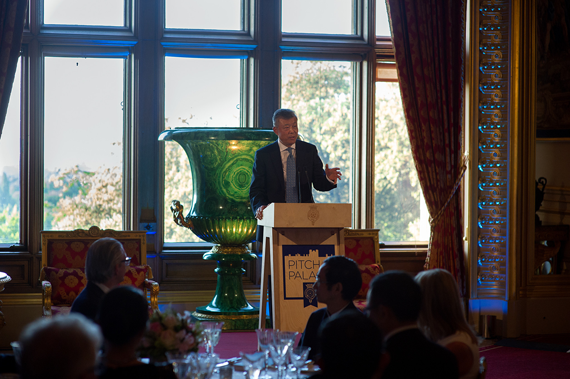 Ambassador Liu Xiaoming at the dinner hosted by HRH The Duke of York: Delivering More "Golden Fruits" in the "Golden Era"
It is a real pleasure to join you here at the Windsor Castle for the dinner hosted by His Royal Highness The Duke of York. I welcome this opportunity to renew our friendship and discuss China-UK cooperation with Chinese and British business communities. A few days ago, Pitch@Palace China 1.0, founded by The Duke of York, held its first final competition in Beijing. Three Chinese hi-tech start-ups, including AI-ROBOTICS, prevailed and became the winners. I would like to extend my sincere congratulations on the success of Pitch@Palace China 1.0. And my heartfelt thanks go to Your Royal Highness for your tremendous contribution to advancing China-UK cooperation. "Only innovators will emerge stronger and set out to win." These are the words of an ancient Chinese philosopher. But how very true they are in this twenty-first century world! Historically, innovation has always been the soul of a nation's progress. Today, innovation is also a prevailing topic of our times. Three years since its establishment, the Pitch@Palace China has stayed committed to attracting the most influential industry leaders from around the globe. It has strived to create quality business environment and resources for start-ups. This echoes with China's idea of innovative development, which is one of the five key concepts in China's 13th Five Year Plan. The presence of Your Royal Highness in the final has been a great inspiration and encouragement to the contestants. The business communities of both countries have also been greatly motivated to take an active part. These have contributed to the success of Pitch@Palace China. They have demonstrated the strong momentum as well as huge untapped potential of China-UK cooperation on innovative start-ups. Early this year, the first freight train of China Railway Express made a round trip between China's Yiwu and London. It was fully loaded with goods and good will. In March, Hinkley Point C saw the placement of the first structural concrete at the technical galleries of the plant. This marked the official beginning of the construction of this flagship project. Also in March, China's Geely Group invested 250 million pounds in Coventry, setting up a new auto factory. Very soon, in 2018, the next generation electric and ultra low emission London black cabs will be running in the street. In May, Chancellor Hammond attended the Belt and Road Forum for International Cooperation as Prime Minister May's personal envoy. His participation in the Forum as the representative of Britain has helped create new dynamics for China-UK cooperation on the Belt and Road. Looking ahead into the second half of this year, I have every reason to expect more gratifying outcomes for both China and Britain. All those outcomes I mentioned above not only help China-UK relations grow in both breadth and depth in this "Gold Era". They also bring tangible benefits to the people of our two countries. For the UK, this year is a special year with important landmark events. Among them, the launch of Brexit process and the snap election have been a focus of attention for all sectors including the business community. However, I am pleased to see that whatever changes occur, it has been the consensus of both China and Britain that China-UK relations must be kept healthy and stable. It has been the shared aspiration of our business communities that China-UK business cooperation must continue to advance. In a world of uncertainty, a sound China-UK relationship will always be a certainty. In conclusion, I hope that the business communities of both countries will seize the opportunity of Pitch@Palace China. I hope our gathering tonight will lead to deeper exchanges and closer cooperation. And I hope everyone will join in to deliver more "golden fruits" in this "Golden Era".